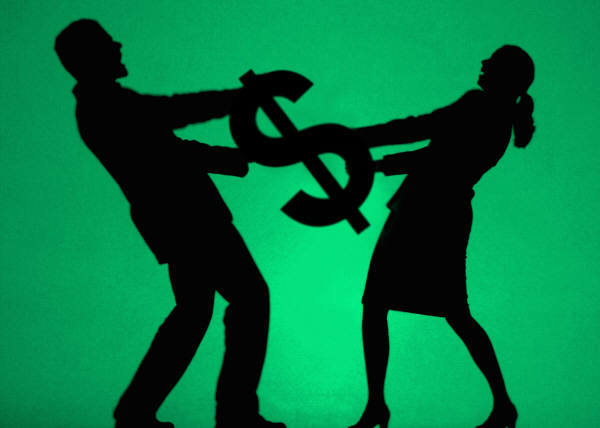 I all see it all too frequently – couples fighting over financial problems. One of the leading causes of matrimonial difficulty is the strain caused by money issues. In these recessionary times, more and more families are facing overwhelming debt. Whether caused by loss of a job, poor money management, reduced income, or increased expenses, financial pressures seem to be at an all-time high. The ensuing stress of fighting over bills and money can take its toll on the marriage, often straining marital relationships to be brink of failure. Most marital arguments are over financial issues. Many divorces are the result of stress and constant fighting over lack of money. Although there are many elements to a healthy marriage, statistics show that divorce occurs more often due to financial troubles than other issue, including marital infidelity, health problems, and growing apart. Financial stress can quickly build to the breaking point. But if you could save your marriage, wouldn’t you? Bankruptcy can come to the rescue and save the marriage. For those who qualify for a Chapter 7 bankruptcy filing, the bankruptcy will likely eliminate all credit card debt and personal loans, effectively eliminating a major source of marital strife. Many of my clients have confided in me after I filed their bankruptcy petition and eliminated their debts, that I rescued their marriage. For those couples with excessive debt, it is important to understand that filing for bankruptcy relief is often an overlooked option that may work to save the marriage. Financial stress can be overwhelming but divorce can be infinitely worse. Filing bankruptcy can be a way to regain control over both your marriage and your finances.